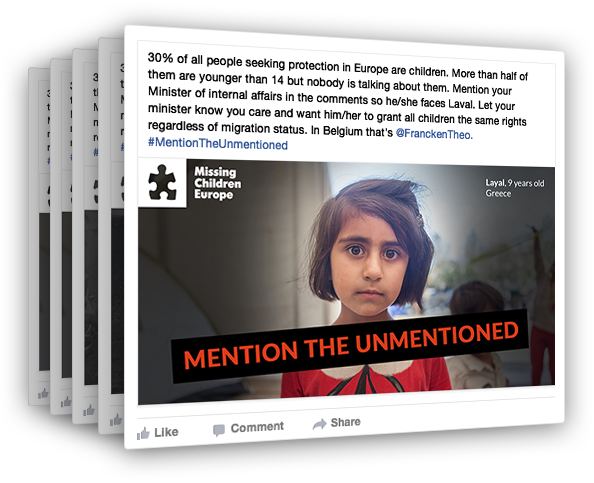 ‘Mention The Unmentioned’ urges ministers to take action for refugee children. Currently Ali is in Cyprus and is staying at the shelter ‘Home for Hope’. He still suffers from hearing loss today as a result of the physical beatings he received from his uncle. He hopes one day that he will get to join his sister in the UK. Story shared by Consortium: SPAVO & HFC (National member organisation of Missing Children Europe in Cyprus) based on children living in their refugee homes. Father and daughter had to walk for days in terrible weather and constantly in fear for their lives. Initially, they stayed at a reception centre with other Syrians while Layal’s father was trying to figure out a way continue onwards to Greece. Suddenly however, Khaled had a stroke and had to be hospitalised. 5 days later, Khaled passed away and left the terrified young girl all alone in a country with no friends or family. Luckily, a Syrian family also staying at the centre decided to take Layal under their wing and paid a trafficker to take them all to Greece. The boat was old and rotten and they left in the early hours of the morning. Layal was scared for her life but the family finally arrived in Leros Island. There they stayed together in Leros for 2 months after which they were transferred to Piraeus port and then to Elliniko where they are currently living. Layal believes she has relatives from her mother’s side in Germany but it has been hard to trace them with the limited information she has. Story shared by The Smile of the Child (National member organisation of Missing Children Europe in Greece) based on children living in hotspots set up for migrants and their families. *After Sochramp shared his story with us, he went missing again. He turned up several weeks later having tried to cross the border into Italy through the port of Patras. He had been arrested and detained at a police station. Eventually he was placed in a centre for unaccompanied children. Story shared by The Smile of the Child (National member organisation of Missing Children Europe in Greece) based on children living in hotspots set up for migrants and their families. When the interview was conducted, Ashkan had already been in the Reception Centre for asylum seekers for 6 months. He had travelled from Afghanistan through Iran, Turkey and along the 'Balkan route' before coming to Croatia. The trip lasted for 2 months. He came to Croatia with his older brother who decided to move on to western countries, after spending few months in Croatia. They are in contact and his brother says he regrets leaving Croatia. Ashkan grew up in Afghanistan and was raised by his father’s cousin. His father was killed in a Taliban’s bomb attack 13 years ago; he was one of 13 people that got killed that day, as he was told by his cousin. Because of that his family moved to his cousin’s home. A year ago his mother died of a heart attack, and he is angry that Afghanistan doesn’t have good medical care because urgent intervention could have saved his mother’s life. His childhood was hard growing up without father. His family were mostly farmers and he didn’t have the chance to go to school at all. Because of the Taliban’s it wasn’t safe to go to school. His cousin treated him and his brother poorly, and as he didn’t have support from his father; he had to work from an early age. His cousin decided to send him and his brother to Europe after Taliban’s attempts to recruit them to the army. As he didn’t have a family except his cousin’s, he gladly accepted the offer to leave Afghanistan and go to Europe to seek a better and more secure life for him and his brother. They started their journey from Afghanistan to Pakistan and then to Iran. They weren’t part of a larger group as is usually the case but were guided by one man. He says he was lucky that he travelled with his brother and that now he feels very lonely, after his brother left Croatia. On the journey he was often very cold, and they would seek shelter in cattle pens in order not to freeze. The coldest days were at the Turkish Iranian border where they had to go through the mountains during winter. They had to wait for hours in deep snow for a truck to pick them up, and the truck often had a flat tire which made them wait even longer. The moment he reached the truck he fell asleep. They were hungry all the time, and smugglers wouldn’t give them any food. He doesn’t think he would have survived the trip if he hadn’t been with his brother who took care of him and told him often that he must go on, that soon it would be over and that they would reach their destination and arrive at a peaceful place. His brother even gave him his own jacket when they were in the mountains. In a way, Ashkan also gave his brother a purpose during the journey, to take care of his younger brother. When arriving to Slovenia, they were tricked into signing some papers that justified Slovenian police to deport them back to Croatia. The Slovenian police treated them badly; some of his friends were hit by batons. Neither he nor his brother had any idea about the asylum system and the rights they had. They were scared that they would get deported back to Afghanistan. Ashkan describes his brother’s psychological problems and why he went on without him. His brother changed when they arrived, he had trouble going to sleep, would gnash his teeth at when asleep, and was nervous and depressed constantly. Now that they are separated, Ashkan doesn’t know when he will see his brother again. He wants to stay in Croatia and hopes his brother will come back once he is granted asylum. He likes Croatia, especially the people. At this moment, Ashkan is still waiting for his asylum status to be resolved so he can settle down, reunite with his brother and go on with his life by putting behind everything that he went through. While the pictures and stories portray real situations of migrants in camps in Europe, personal details and identifying factors may have been changed to protect the privacy of the individuals.